Sandos Hotels and Resorts had an impressive portfolio of properties, but their existing website wasn’t conducive to actually booking a room. It was proving to be a barrier that turned away valuable American business. 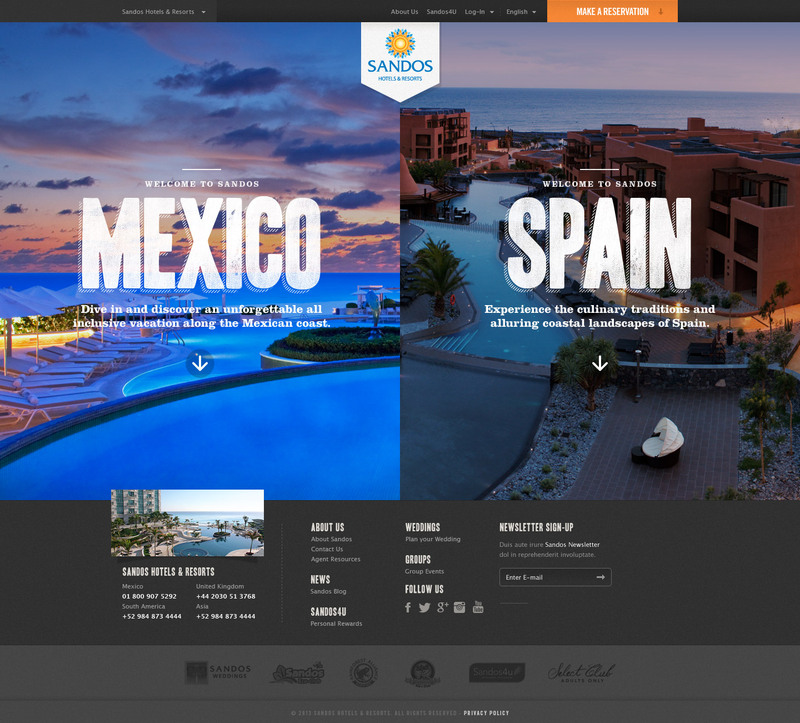 In order to drive sales and reach the American audience, we completely redesigned the Sandos website. The goal was to create a bright, inviting site that was easy to navigate and compelled users to take that final step and book a room. One of the biggest issues with the old Sandos.com was that it wasn’t easy to go from browsing the properties to booking a room. Now, “Make a Reservation” is always present in the header so the user can begin the booking process from any area of the website. It doesn’t matter if you’re clicking through different room options or checking out menu options at a hotel’s restaurant; you’ll always be able to immediately make your reservation. The website is first broken down by desired country—Mexico or Spain—and then by the type of “Experience” that can be had at each hotel and resort. The “Luxury Experience” might be geared more toward a couple while the “Beach Experience” resort might be most attractive to a family with young children. Further subsections help users pinpoint exactly which destination is right for them. The end result is a vacation that feels as if it was tailored to a user’s own preferences. To help increase traffic, we created a custom Facebook app—The All Inclusiv(er)—as a way for people to create a personalized poster declaring their vacation style. People who make a poster are entered to win a week at one of the Sandos Mexican resorts. If their entry is picked, it’s off to the beach for nothing but pampering and relaxation.